Radford University was founded as a teacher-training school in 1910. During the past 108 years, it has grown and developed, first into a state college and then a university. The next stage of its evolution is expected to take place next year. By fall 2019, Radford may have the second-largest nursing school in Virginia. If preparations stay on schedule, by then Radford will have absorbed the Roanoke-based Jefferson College of Health Sciences, adding 14 programs and about 1,100 students to Radford’s 9,418 students already studying in 105 programs. Jefferson College is owned by Carilion Clinic, a Roanoke-based health system with seven hospitals in Southwest Virginia. 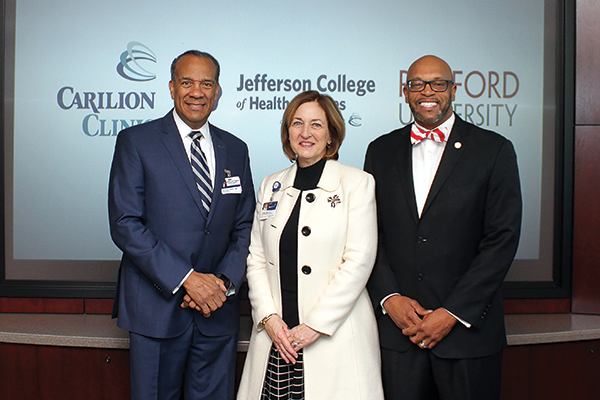 When Carilion, Jefferson and Radford announced the merger in January, Carilion President and CEO Nancy Agee called it a wonderful opportunity for Jefferson and the region. Carilion has some experience with educational partnerships. The Virginia Tech Carilion School of Medicine opened in 2010 as a joint venture involving the health system and the university. In July, the medical school became Tech’s ninth college. That’s when Radford absorbed the hospital’s nursing school. This fall, Radford’s nursing programs had 273 students. Jefferson had 470 nursing students. The proposed merger of the Radford and Jefferson programs is taking shape at a time of growing demand for health-care professionals. The Bureau of Labor Statistics estimates, for example, the country will have 438,000 new registered nursing jobs by 2026. Combined with an aniticipated wave of baby boomer retirements, that means more than 200,000 openings for nurses each year over the next decade. Nevertheless, according to the American Association of Colleges of Nursing, nursing schools turned away more than 64,000 qualified applicants in 2016 because the schools did not have the space, faculty or funding to accommodate them. Jefferson College’s earliest ancestor, the Lewis-Gale School of Nursing, began in 1911, the same year construction began on the State Normal and Industrial School for Women at Radford. The schools collaborated as they evolved and expanded. In 2010, Radford opened its doctoral program in physical therapy on Jefferson College’s Roanoke campus. In 2015, Jefferson, Radford and the VTC School of Medicine opened the $2.5 million Virginia Intercollegiate Anatomy Lab on Jefferson’s campus. Getting to that point will be complicated. It means moving more than 1,100 students and shifting or absorbing three certificate programs, 11 bachelor’s programs, five master’s programs and two doctoral programs. If the General Assembly and the State Council of Higher Education for Virginia approve the merger plan, associate-degree programs for physical therapy assistants and surgical technicians will move to Virginia Western Community College. Students currently in those programs will “complete their degree programs based on requirements in place at the time of admission,” according to Hemphill. Many of Jefferson’s programs will find a new home in Radford’s Waldron College of Health and Human Services, which includes the school of nursing; the departments of communication sciences and disorders; physical therapy; occupational therapy and the school of social work. However, Jefferson’s medical laboratory science bachelor’s degree and certificate program as well as its bachelor’s degree in biomedical science will move to Radford’s Artis College of Science and Technology. Students in Jefferson’s occupational therapy assistant associate-degree program will complete their studies through Radford. If the commonwealth and accreditation organizations approve, the university will add a bachelor’s degree program for occupational therapy assistants. Figuring out how programs from two schools will fit together is complicated enough, but two information technology systems, two student bodies and two sets of faculty and staff must be integrated as well. Those subcommittees are far from finishing their work, but they seem to have at least some answers beyond which programs will land where and what they’ll require for graduation. For instance, students applying to Jefferson next fall must agree to share their application information with Radford. They’ll also be encouraged to submit Free Application for Federal Student Aid (FAFSA) forms to both schools. Jefferson will use its regular admissions standards and process for all programs except the master’s degree program in occupational therapy, which will have a common admission process. Radford students have long gotten work experience at Carilion. According to the university, more than 500 Radford students had job shadowing, clinical rotations or internships with Carilion in 2016-17. But things are about to get even better, according to Hemphill.